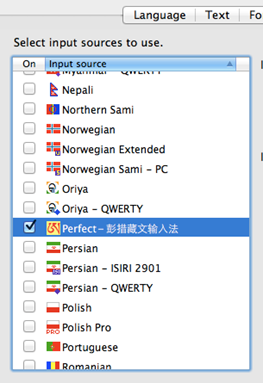 Perfect is a Tibetan input utility jointly developed by Department of Computer Science of Jinan University, sponsored and supervised by Tudeng Nima (Alak Zenkar) Rinpoche. 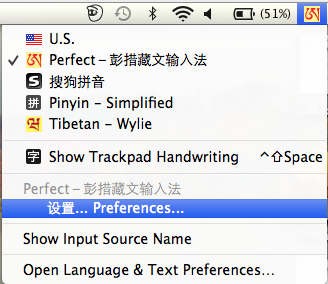 The software is based on the Wylie transliteration and Unicode Tibetan fonts, supporting Tibetan phrase input method with an input-dictionary containing terms up to 120,000, which includes 8000 terms of modern vocabulary. 1） Installation: Run ”perfect_input_install.pkg” and logout to finish installation. 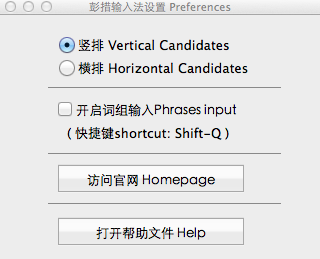 2) To launch the Perfect input method: Click the input method icon on the upper right of the screen, select "Open Language and Text Preferences ..." in the drop down menu, and then select " Perfect-彭措藏文输入法" in the "Input source". 2） The input method has two input modes: The "phrase input mode" and the "verbatim input mode", and the default mode is the "phrase input mode", Use shift-q to toggle between two modes. 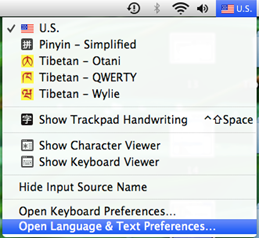 3） In the " verbatim input mode", use the Wylie transliteration to input Tibetan, where the SPACEBAR is for syllable spacer ཚེག " ་ "; In the "phrase input mode", the Wylie transliteration can also be used to input verbatim Tibetan, but the syllable spacer is the comma key ",". 4） In the "phrase input mode", when you press the SPACEBAR, a candidate window will pop-up, at this time, use the "Number Key" or the"Enter Key" to select a candidate and, if necessary, use the left or right arrow keys to turn pages, and use the up or down arrow keys to move up or down in the candidate window. 5） Select the "设置... Preference... " menu item to configure the input method and to get the help information. 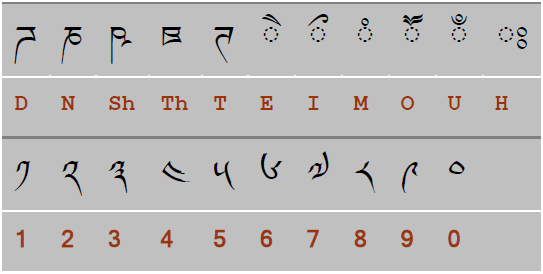 The input method basically uses Wylie transliteration scheme where འ uses the apostrophe ' and ྰ uses the capital letter A, so གཱ becomes gA. . The input method has two input modes: The "phrase input mode" and the "verbatim input mode", the default mode is the "phrase input mode", use shift-q to toggle between two modes. The default input mode is the "phrase input mode", or you can press shift-q to switch back. (1) Use pure root consonants. This is the simplest way for typing long phrases. (2) Adding vowels to some root consonants to narrow the matched results. (3) For long phrases (e.g. more than 5 syllables), it is not necessary to type each of the root consonants of all syllables from beginning to end. Use the asterisk "*" as a wildcard character at the end of the input string for neglecting the rest syllables. In the "phrase input mode", after you have entered the phrase code, press the SPACEBAR, a candidate window will pop-up, at this time, use the "Number Key" or the "Enter Key" to select a candidate and, if necessary, use the left or right arrow keys to turn pages, or use the up or down arrow keys to move up or down in the candidate window. Note：Use the "a" vowel to avoid unexpected stacks, for example: if you want རཀ instead ofརྐ, then use rak instead of rk.